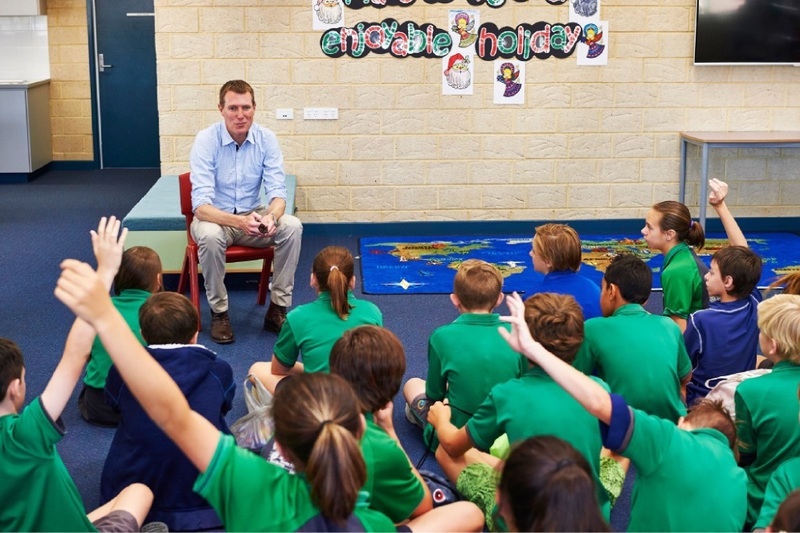 The Year 6 students heard about parliamentary life from Pearce MHR Christian Porter on December 10 and showed him around their school. “The questions asked by the students were both well thought out and entertaining and I enjoyed sharing my knowledge and experiences with them,” he said. A: I was a massive sci-fi fan growing up and loved Star Wars. However, my career as an astronaut didn’t work out and I ended up in politics instead. Q: What was the most important contract you ever signed? A: When I worked in state politics I signed the contracts for the Elizabeth Quay project that is currently under construction, which is a very large project, so that was probably one of the most important contracts I have ever signed and a very exciting one for WA. Q: How did you become a minister? A: I was actually in my back yard with my dog when my phone rang; I pulled it out of my pocket and saw that it was the Prime Minister calling me. He asked if I would be the Minister for Social Services and of course I said yes. You never turn down a job that the Prime Minister offers you. Q: What do you think is the most important global goal? A: Free trade – swapping things that we make with things that other countries like China make – swapping things we are good at so that everyone benefits. Q: If you lost your job as a minister which would you rather be – a surfer or a skateboarder? A: I would have to say surfer, because I don’t think a 45-year-old skateboarder would be very cool. Q: Do you ever make mistakes? A: Yes, of course. Everyone makes mistakes; you just have to make sure you learn from them.